In this heyday of A/V receivers it is becoming increasingly difficult to find a “standard,” non-A/V model. With the growing popularity of home theater installations, other traditionally audio-only components are showing signs of following the receiver’s lead. One example is Kenwood’s KC-X1, the first tuner/preamplifier we have reviewed that has full audio/video control and surround- sound decoding capabilities. It has in puts and switching for as many as five audio and four video components, with line-level outputs for external power amplifiers to drive three front speakers (left, center, and right), a pair of surround speakers, and a subwoofer. Its AM/FM tuner provides for as many as thirty preset station frequencies. The KC-X1 has signal-processing circuits for Home THX, standard Dolby Pro Logic, Dolby 3 Stereo (for systems with three front speakers but no surrounds), and DSP Logic (a hall-ambience simulation intended for use with normal, unencoded stereo program material). There is a bypass mode for conventional two-channel stereo listening, and a mono mode feeds all signals into the center speaker, if one is present, or equally through front left and right speakers. In systems with surround speakers but no center speaker, the surround processing can be switched to a phantom-center mode. Inputs are provided for CD and moving-magnet phono sources, and there are recording and playback connectors for two audio tape decks and three video recorders, plus inputs for a play-only video source such as a laser-disc player. For two of the VCR sources, there are S-video connectors as well as the standard phono jacks for composite-video signals. The video outputs to the monitor are also provided in both composite and S-video for mats. The composite-video and S-video signals are handled separately, with no facility for conversion between them. A loop antenna is provided for the AM tuner, and a 75-ohm coaxial jack is used for the FM antenna. The KC-X1’s rear apron has jacks for use in remote-control systems with compatible Kenwood components. Its three switched, two-prong AC outlets have a combined power rating of 940 watts. The KC-X1 is supplied with a sys- tern remote control that is internally programmed for operating two Kenwood tape decks as well as all the normal functions of the receiver. 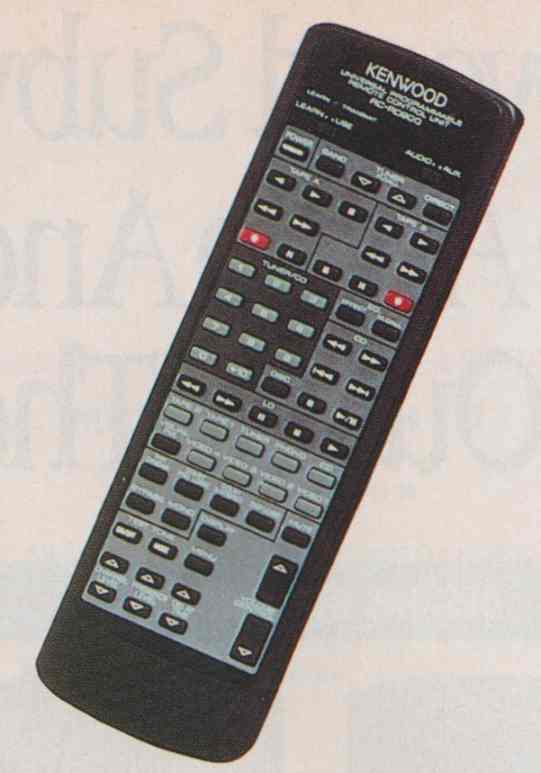 The remote can also be set to learn the commands for other makes and models of components. Although it contains no power amplifiers, the KC-X1 is a large, heavy (23-pound) unit that resembles a well- appointed and rather powerful receiver. The dominant feature of its front panel is an 11 1/2-inch-wide window displaying its operating mode and selected source in large characters and most of the other operating parameters in smaller characters. Below the window is a row of slender buttons used to select the audio operating mode (which appears in the window) and the tuner band and to vary the tuner frequency up or down. A large knob to the right of the window adjusts the volume in a rather unusual way. The adjustment is digital, made in fixed 1-dB steps as the knob is rotated. The knob turns continuously and smoothly, with no de tent action, and requires four complete rotations to cover its full 79-dB range. The volume setting (in decibels below maximum) appears in the window. A smaller knob below the volume control is the input-source selector, which also rotates continuously, though with light detents. When connected to a video monitor, the KC-X1 can present a more complete display of its control functions and settings than in its own window. The on-screen display is available only through a composite-video monitor connection, however. Other than the selector buttons and the two knobs, the power switch, and a couple of inconspicuous buttons for audio muting and monitoring from Tape 2, there are no visible controls on the front of the KC-X1. As in some other complex components, the less frequently used controls are behind a door across the panel below the display window. Hinged down, it reveals a group of small buttons used for programming and recalling the tuner pre sets. Other buttons activate the center-channel output, the tone controls, and the surround test signal (a random-noise signal that switches sequentially through the various channels of the THX and Dolby Pro Logic modes as an aid to setting channel levels). One knob adjusts the level of the selected channel, and another adjusts the left/right balance. Small up/ down rocker switches adjust the bass and treble response in 2-dB steps over a ± 8-dB range. Similar controls adjust the level of the surround outputs in the DSP mode over a 20-dB range in 1-dB steps, and another varies the surround-channel delay from Ito 80 milliseconds in DSP Logic mode and from 15 to 30 milliseconds in the Dolby Pro Logic and Home THX modes. All figures are for FM only except frequency response. All figures are for main front channels only. Our measurements of the Kenwood KC-X1 consisted primarily of conventional tuner and preamplifier tests. We evaluated its signal-processing functions by listening, mostly to CD’s and FM broadcasts. The tuner section’s performance ranged from superb to undistinguished. On the positive side, capture ratio was very good, as was the hum level. At the other extreme, there appeared to be little or no filtering of the 19- and 38-kHz stereo pilot and sub- carrier signals from the tuner’s output, with the result that conventional distortion and signal-to-noise-ratio (S/N) measurements could not be made in stereo (the distortion was completely masked by these spurious signals from the multiplex decoder). But spectrum analysis showed that the actual stereo program distortion was also relatively high, just below 1 percent at most signal levels. The AM response was unusually restricted (-3 dB at 1.8 kHz), even by the prevailing standards for that medium, and FM channel separation and image rejection, though adequate, also fell somewhat short of what we normally expect from a component in the KC-X1’s price range. Our test sample (which bore serial number 1) nonetheless performed very well in listening and use tests. Even without a video monitor attached, the KC-X1 was very easy to set up and adjust as the heart of a basic four-speaker surround-sound system. We found the human engineering of its unusual control system to be first-rate (once we had read the very thorough instruction manual), and the component was actually simpler to operate than many less versatile units we have used. The KC-X1’s range of adjustment was quite adequate to produce any desired spatial effect with a variety of music programs. The one operational idiosyncrasy we encountered had to do with a small switch on the back panel, which the instructions said should be set to “on” when a subwoofer is used, presumably to provide a suitable low-frequency program output to it. They did not mention, however, that it is equally important that the switch be set to “off” when a subwoofer is nor used. Also, the switch position should be changed only while the KC-X1 is turned off (which is mentioned in the manual, but in fine print at the bottom of page 9). When we left the subwoofer switch on, the unit appeared to work normally, but frequencies below about 70 Hz were sharply attenuated. That effect may not be particularly audible, de pending on the program material and loudspeakers used, but it certainly gave us some bad moments during the measurement process. Actually, this is a very useful feature, since removing low frequencies from the main speakers when a subwoofer is used (as would normally be the case in a Home THX setup) can only improve the system’s performance. Intrigued by the KC-X1’s impressive bulk and weight (after all, it is a tuner/preamp, not a full-blown receiver), we removed its top cover, revealing a well-filled interior with perhaps five or six good-size circuit boards on two or more levels. Even without further knowledge of the internal circuitry, the reason for the KC-X1’s size and weight (and price) became obvious. And given its obvious emphasis on audio/video system performance, it was easier to understand why it was fitted with an adequate, but not particularly advanced, AM/FM section. Although we did not test it, the KC-X1 has a companion six-channel power amplifier, the KM-X1, rated for 100 watts per channel, and the two provide formidable audio/video reproduction capability at an exceptionally low price for Home THX-certified components. But, as our experience showed, the KC-X1 can deliver impressive performance in conjunction with almost any combination of power amplifiers. The tuner/preamplifier appears to be a product format whose time has come, and we will surely see others like the KC-X1 in the near future. Measurements and listening tests of the Kenwood KC-X1’s Dolby Pro Logic surround-sound performance gave very good results. Measured noise levels and distortion were very low, and the channel separations and overload margins were more than adequate. Both main-front and center Pro Logic frequency responses could be flatter at the extreme high frequencies (they were —1 dB at 16.25 kHz), but the deviation should be inaudible to most ears and with most program material. Worst-case THX equalization errors were negligible through the front and center speakers, but response was down slightly at 4 kHz through the surround channels. Especially noteworthy was the unusually accurate level calibration of the surround-sound decoder when measured through the playback-only video input (Video 4). When this input is connected to a videodisc player with a nominal 2-volt maximum output, the KC-X1 should provide a less muffled surround-channel frequency response than most decoders do, though the difference would be difficult to hear with most soundtracks. Home THX processing consists mainly of special equalizations applied to the five principal outputs of a standard Dolby Pro Logic decoder. The KC-X1’s adherence to the THX equalization specifications was on the whole very good, and we would not expect the minor deviations we did find to be audible with normal recordings. The special THX “re-equalization” applied to the front, center, and surround speakers adjusts the high- frequency response so that soundtracks originally equalized under studio dubbing-stage conditions end up sounding the same under the very different acoustical conditions of a home listening room. All the movie soundtracks I played through the KC X1 in Home THX mode benefited from this re-equalization, becoming markedly less harsh when played at high levels. Although I happened to listen to the KC-X1 though a six-piece Home THX-certified speaker system, the same effect should be apparent with any reasonably good assemblage of speakers (ideally a set with sonically matched main and center units). Home THX processing applies another layer of equalization to the surround channels to make their timbre more closely match that of the front speakers. A sound panned from the front to the surrounds is not supposed to change in timbre. But the benefit of the Home THX surround equalizer seems to be less consistent than that of the Home THX re-equalizer. Listening in Home THX mode to a specially constructed test signal (pink noise digitally band- limited to 7 kHz that flipped every second from one of the front speakers to the surrounds), I never heard an exact timbre match, even through Home THX speakers. But the tonal difference between front and surround was indeed less than that produced with straight Dolby Pro Logic decoding, so there is some advantage to the Home THX surround equalization. I also noticed that the sonic match improved if the surrounds were located where they should be, to the sides and several feet above ear level, rather than close to ear level or at the rear. The front/surround similarity deteriorated slightly when non-THX dipole surrounds were used, and further when conventional speakers were used for the surrounds, to the degree that there was no appreciable timbre-match advantage to switching in the Home THX processing with those speakers. But Home THX processing also involves a surround-channel “decorrelation” circuit whose effects were readily apparent regardless of the type or location of the surround speakers. The decorrelation serves to scramble the relative phases of the two surround speakers, which would otherwise receive an identical signal. All of that is to promote the disappearance of the surround speakers as discrete sound sources. With decorrelation switched in, the sides and rear of the listening room should seem to vanish, replaced by the sonic environment created by a movie’s sound designers. The decorrelation was far more effective with soundtracks than the standard “dual-mono” treatment of surrounds (so much so that I wish the processing were available in the regular Dolby Pro Logic mode as well). At least as executed in the KC-X1, however, it seemed to introduce a slight sense of “swimminess” to the surround signal that is hard to describe but easy to hear with pink noise. On more mundane matters: The KC X1’s programmable remote is not well laid out, with tuner buttons split into two sections, both separated from the rest of the controls. I also found that most of the buttons were too small, and, except for the volume buttons, they were not differentiated by size, shape, or feel. The button labeling could stand some revision as well (“mode” to change speakers when adjusting surround-sound balances, for example). The rear-panel input-jack layout is of the desirable horizontal variety, however. Considering the FM tuner’s measured performance, I wish Kenwood had incorporated a high-quality cable-ready TV-sound tuner instead, something that is hard to find except in some high-end VCR’s. If you are planning a component-by- component transformation of your present system into a home theater setup, the Kenwood KC-X1 is a good place to start. You’ll get an outstanding Dolby Pro Logic decoder plus Home THX processing, which can provide sonic benefits even without Home THX speakers. But once embarked on the Home THX path, you should consider getting Home THX speakers if you can. The experience of a complete Home THX system going full tilt on a well-produced movie soundtrack can be stunning. All measurements are referred to 1-kHz levels at the Video 4 input of 200 millivolts (mv) for the front channels, 141.4 millivolts for the center and surround channels, with the volume control at its 0-dB setting. All measurements were made with the Normal center- channel setting except frequency response and channel separation, which were made with the Wideband setting. Except where noted, all measurements refer to Dolby Pro Logic operation only.